Description: CP train 882 heading for the Portage, WI power plant. Description: Two EMDs up front....not bad. Description: Empty coal train rolls down BNSF's Big Horn Sub. Description: BNSF 9206 brings up the rear of an empty coal train on BNSF's Big Horn Sub. Title: BNSF 9206 leads a large coal train sb at foley. Description: Missed on this one. Description: Cool to see a pair of units consecutively numbered like that. Description: A loaded coal drag rolls into the new siding in Clarksville Mo called burns. 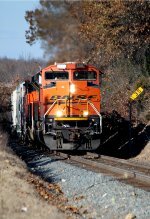 Title: BNSF 9206 Roster shot. Description: The second shot at Baron is rolling past the church there. It always makes for a great afternoon shot. Description: This long view of the southbound sand train shows the length even short 2 bay cars have when there are 100 of them. Description: After meeting the UP train, the empty oil train still wasnt moving, so it seemed another meet was imminent. We headed toward Decatur to see if we could catch the southbound there, and saw him just south of town. This is the view at Y City Road as he drags over the top of the grade there at MP 219. Description: The sand train rolls through the home signals at South Gentry as the empty oil train starts to pull away, finally on the move after at least a 2 1/2 hour wait. The oil train had a CSX leader, not very common, and the original plan was to chase it north. The mid day light was awful, so I decided to chase the sand train. Things don't always work out the way you think they will. Description: Theres a right hand curve and signal at MP 252, a great shot with a tele. I just beat him here, dodging the chickens that wandered into the road from the adjacent house. 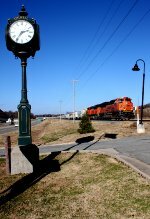 Description: The sand train rolls past the clock outside the Stilwell station. Description: The sand train rolls past the Adair County barn, until recently a body shop. Description: The speed sign shows 35 for the curve just to the north. Southbounds encounter a short grade here, and heavy trains wont be making even that speed. Description: After catching him at Gentry, I dropped my wife off at home, then took off. I beat him to the HJ Baker mill by only about 60 seconds.